Commonwealth medal-winning Judo champion, Sky Sports Living for Sport Athlete Mentor and London 2012 hopeful, Tom Davis visited Kingsbury High School on Wednesday 14th December to help launch the school’s Olympic values awareness campaign, P R I D E.
The campaign features an on-going series of posters, produced by the school’s Creative Team, of students sport leaders participating in Olympic, Paralympic and Winter Olympic sports in unlikely locations around the school. The P R I D E campaign promotes the school’s chosen Olympic values of Personal Excellence, Respect & Friendship, Inspiration, Determination & Courage and Equality. 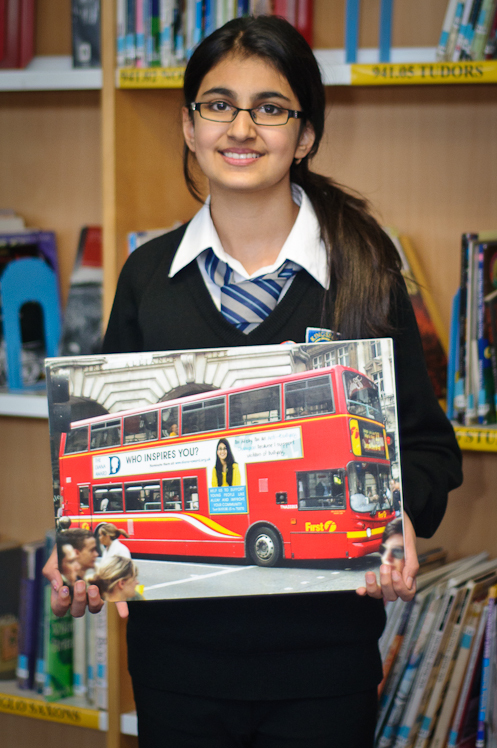 Kingsbury High School student, Alizay Agha has been chosen as one of the faces of the Diana Award anti-bullying advertising campaign. Alizay features in an advert on the route 23 bus which runs across the centre of London. First London, part of First Group plc, has donated advertising space on five of its new London buses to the Diana Award, in recognition of young people’s dedication to improving their communities. Five young people, each with their own inspiring story, feature in the campaign, Who Inspires You? The five young people represent the five Diana Award categories – the Diana Anti-Bullying Champion, the Diana Active Campaigner, the Diana Champion Fundraiser, the Diana Champion Volunteer and the Diana Courageous Citizen. Minister for Children and Families Tim Loughton met the exceptional young people who are the faces of the campaign at the Houses of Parliament on Monday 12th December 2011. Alizay was nominated by her teachers for a Diana Anti-Bullying Award for her commitment to tackling bullying. Alizay went through a difficult phase in her life, where she was being bullied severely. After fighting through this she was motivated to share her experience and knowledge on Anti-Bullying with other pupils in her school. She took part in a one week training course with an organisation, PeerLink, a national network for young people involved in conflict resolution and mediation. She became a trained and certified mediator and along with the other pupils, they set up a lunchtime drop in club and called Unite. Alizay was asked to mediate pupils who were being bullied, and she helped them re-gain some confidence. Alizay has tried to create a new mind-set for pupils in her school focusing on self acceptance and accepting others. Alizay also visits primary schools to educate the younger children on what bullying is and how we can prevent it. The young people who are part of the campaign also went to Downing Street to deliver photographs of the campaign to the Diana Award Patron David Cameron. 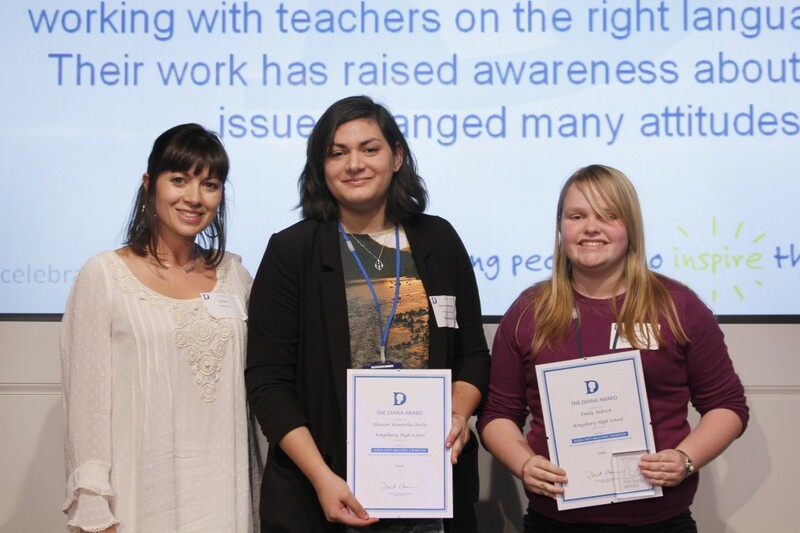 Former students Emily Aldrich and Eleanor Rambellas-Roche have been publicly honoured with the Diana Award for their work within Kingsbury High School’s anti-homophobia group, Cambio. Cambio was nominated because the members of the group worked really hard to make Kingsbury High School a better, more tolerant, place for staff and students. The students were really brave to do this, as a high school can be a difficult place to talk about Lesbian, Gay, Bisexual and Transgender (LGBT) issues, and they worked really hard, despite the pressure of exams and university applications. Emily and Eleanor received their award at the Diana Award Inspire Day 2011 held at Barclays Corporate in Canary Wharf on Monday 12th December. Clare Nasir – ITV weather girl, presented the Diana Anti-Bullying Champion Award to them. Kingsbury High School student, Shawna-Lee Lewin, has won a £10,000 prize for the school in an art competition. Kingsbury High School submitted art work by students to the competition organised by Viking office stationers. The competition brief was to create an image that ‘reflect what students like about their school’. Shawna-Lee’s entry beat over 3,000 entries from schools across the UK. Shawna Lee’s winning entry has been featured on the front cover and in the month of June of the 2012 Viking for Schools calendar.